Liam Webster plays Jack in the Gaiety Theatre's panto. Up and coming Stenhousemuir actor Liam Webster is going all the way to the top in his latest panto lead role at Ayr’s famous Gaiety Theatre. The former Larbert High School pupil is playing Jack - the likeable loon who swaps the family cow for magic beans - and ends up climbing an enormous sky-high bean plant to encounter all sorts of hazards. But this should all be plain sailing to a young actor who has already won rave reviews for his performance in a very different male lead role. Two years ago he was described as a “bubbly” Romeo in the Cambridge Shakespeare Festival version of Romeo and Juliet, and has several other major plaudits to his credit. 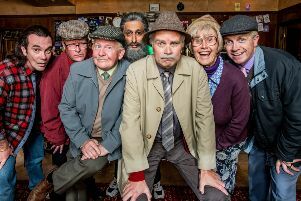 He is a natural ‘main man’ for panto, having played both the Beast and the Prince in Beauty and the Beast, and in this version of Jack and the Beanstalk is said to be thrilled to play alongside actors including Jane McCarry (Fairy Beansprout) – best known to fans of TV’s Still Game as the irrepressible Isa. Liam (playing Jack Trott) was a member of Falkirk Children’s Theatre and Stageworx theatre school before training at the Mountview Academy of Performing Arts, where he gained a BA in Performance (Acting). He’s delighted to be back at the Gaeity, and for this production will be shinning up and down that giant beanstalk from now until January 4. Will he find true happiness with Princess Jill before the curtain falls at the end of the show – and defeat evil baddie Flesh Creep?